The Creme Brulee man would prefer that you don't know who he is, if you hold any position of authority with the city and county of San Francisco. Shh...if you are reading this, make sure no one is looking your way. The Creme Brulee Man wants you to know where he is but he just doesn't want "the man" finding out. 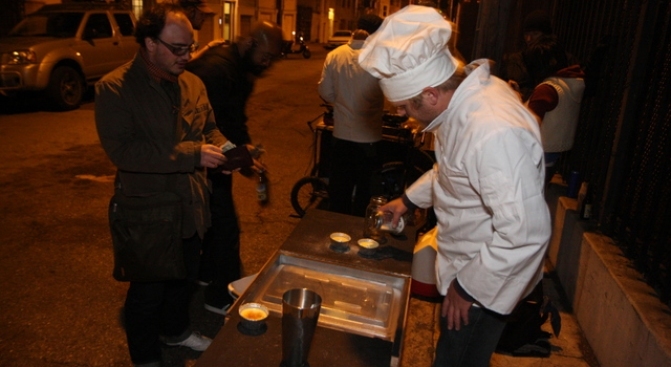 After giving him some love here for serving creme brulee out of a push cart and Monday's San Francisco Chronicle revelation that the city cracking down on illegal food cart vendors, Curtis "the Creme Brulee Guy" wants to go back under board. "If you receive this top secret mission, please do not retweet," Creme Brulee Man tweeted early Monday morning. "If you don't make it in time, I'll see you in mid June. Best of luck." To avoid being shut down by the city, which vigorously controls who can sell street food, Curtis is now asking people to send him a direct message on Twitter and he will respond with his location. He will presumably only respond to people who don't appear to be the fuzz. "If you reply to me in the next hour or have replied to me you will receive a (direct message) about Thursday night's top secret brulee-ing later tonight," he tweeted. Maybe we've said too much.